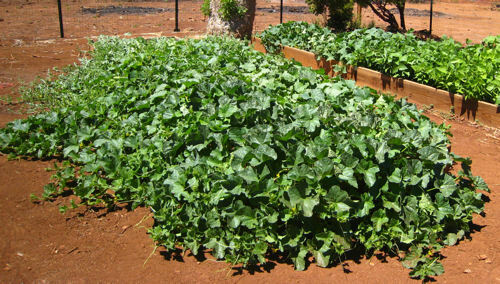 Now that we’ve moved to a hot, dry climate, we couldn’t wait to grow melons – watermelons and canteloupes. We even bought a popsicle-making kit to handle the harvest overflow (Gigi loves watermelon popsicles). All our melon seeds were purchased at the Seed Bank in Petaluma. 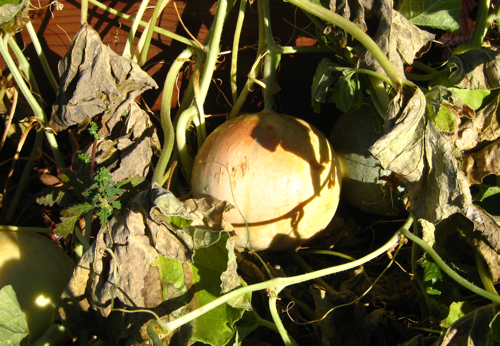 Alas, not all the melons we planted produced sweet, juicy fruit we had anticipated. And despite the incredible vigor of these plants, we did not get as much fruit as we had hoped (so much for those popsicles). 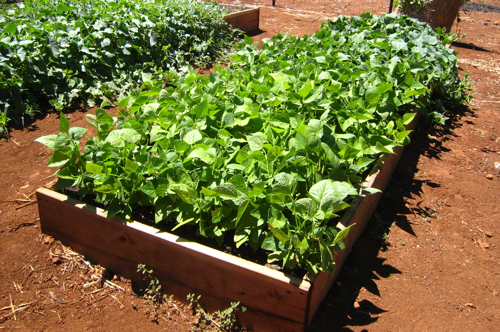 Here’s our Plangarden raised bed layout that shows what we planted. Honeydew Orange Flesh and Charentais were winners! “Far North”, suggests that it can be grown in higher latitudes that have shorter growing seasons. Our patch first produced fruit in early July. They looked beautiful. Perhaps we harvested them too late (early- to mid-August), but the puny, starchy canteloupes were like a hybrid of styrofoam and an Idaho potato. We’d probably try them again next year and see what happens if we harvest them earlier. But these melons are so small, less than single serving, and not really worth the effort. Puny Far North canteloupes were a disappointment. Did we harvest too late? “Golden Midget” got us all excited. They are beautiful 4-5 lb. 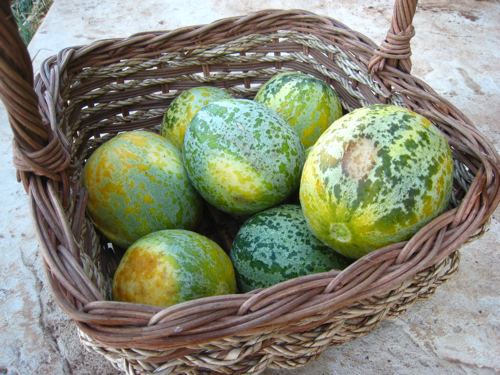 watermelons that start out green and then turn deep yellow once they’re ripe. While they were certainly juicy, they lacked any kind of sweetness you’d expect from a home-grown melon. We were sad to admit that the supermarket melons were far superior. “Honeydew Orange Flesh” was the winner. Biting into the firm, honeydew-type orange flesh feels so sinful – it’s like candy, but not sickeningly sweet. And a close second is “Charentais”, a much smaller fruit with the lighter flesh of a canteloupe. 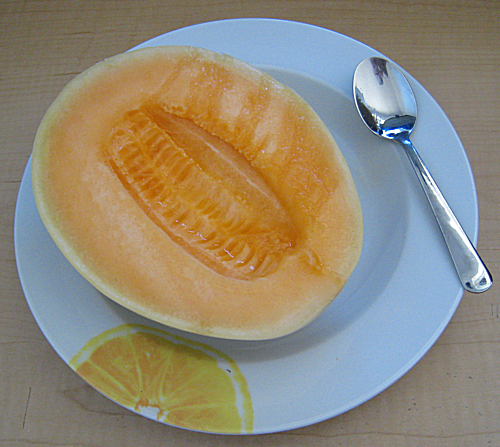 Honeydew Orange Flesh were firm, like honeydew melons, but sweet like canteloupes! And the first runner up is ... the Charentais canteloupe! We had problems trying to start “Sugar Lee” from seed, and unlike the other melons, it took 2-3 attempts to finally get a plant to grow. We have one fruit (just one!) which looks like it’ll be about 8 lbs. The jury’s still out but I doubt this can outdo our winners. What could we have done wrong with the other melons? Did we overwater them? Perhaps. But how does this account for the success with the other melons? 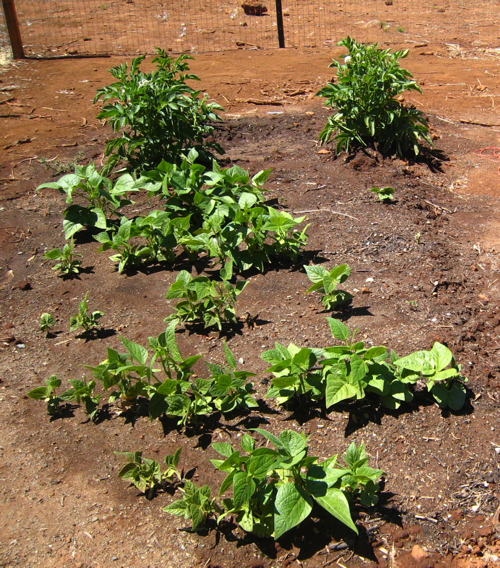 We did start the plants in rich soil with lots of seasoned horse manure, and fertilized them regularly. If you grew melons this year, let us know which varieties you loved. And we’d appreciate any tips on improving flavor and harvest 🙂 ! 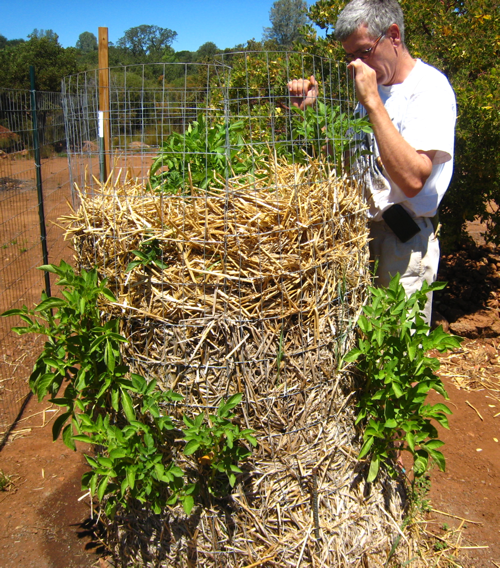 Roy inspecting our potato tower which is beginning to blossom! Our melon and watermelon patch is going nuts! Good thing we provided lots of “crawl area” for the vines in between boxes (~4-5ft). The “Far North” melon (~65 days) already has fruit the size of a baby’s head. 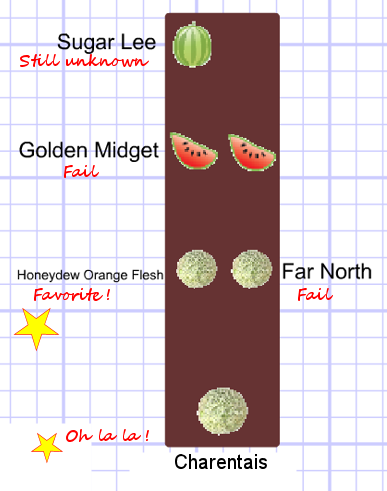 The “Golden Midget” (~70 days) watermelon has some fruit about the size of small apples. This 3-pounder’s rind is supposed to turn golden yellow when ready to harvest – can’t get easier than that! As for the “Sugar Lee”, we have had lots of trouble germinating this baby which is supposed to produce 15-18 pounders. Only one plant is growing vigorously, albeit slowly. But if it succeeds, we may be harvesting watermelons through October! Melon and watermelon tendrils have draped well over the sides of garden boxes! The Yin-Yang shelling beans grown in this box are thriving; so are the cukes “Dragon’s Egg” (technically a melon) and “Straight Eight”. Royal Burgundy beans in the neighboring box are also doing well though surprisingly not as prolific as I had expected (we’ve only had 1 meal and it’s mid-July!). Suspect a small varmit has been visiting. Roy’s looking to see if the Butternut squash have developed fruit (not yet). 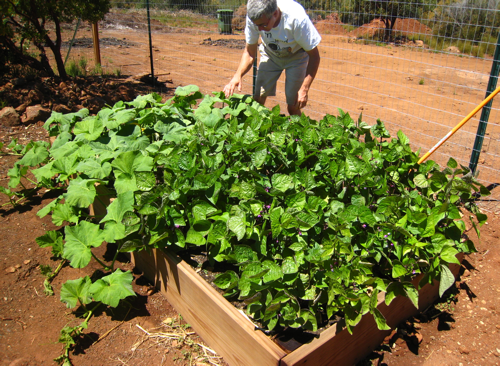 We love it when a stray seed or two goes from soil to compost and back to new soil. These two beautiful purple Amaranth plants are “squatting” in between the bell peppers. We didn’t have the heart to remove them, and the peppers don’t seem to mind it (yet). We will probably harvest the Amaranth leaves for salad and not let them get too large. In the rear of the box are a gorgeous sweet Armenian cucumber (“Metki White Serpent”) and two prolific straightneck yellow summer squash plants. 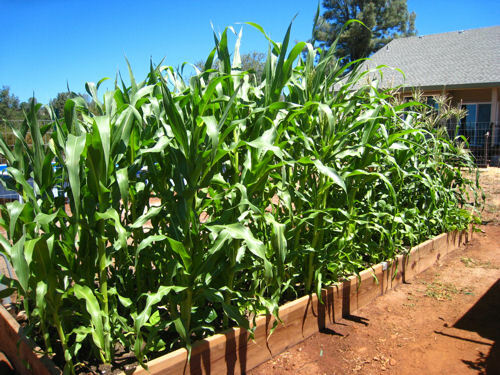 Our last veggie box houses the corn. We sowed two different varieties with different days-to-harvest times about a week apart to further stagger the harvest. 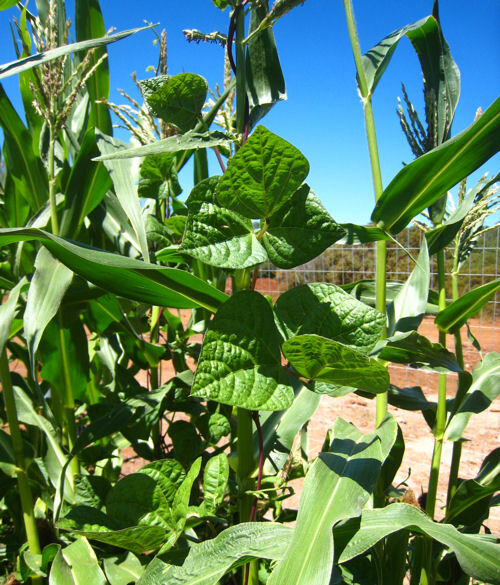 We also sowed climbing beans about 2 weeks after planting the corn so that the stalks would be larger than the bean plant. This looks successful so far. 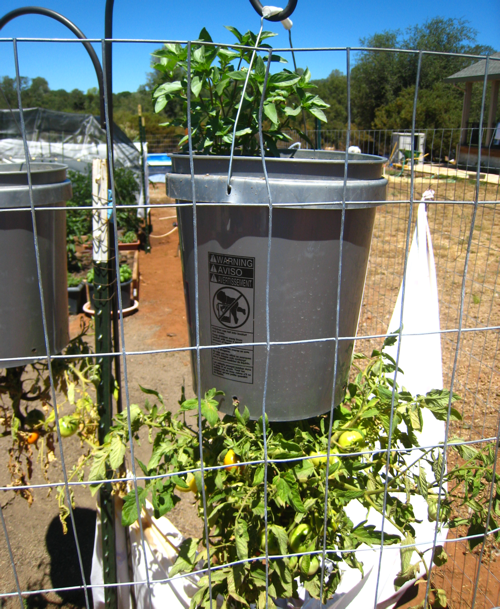 Upside-down tomatoes may have broiled in those plastic buckets. Thai basil on top. 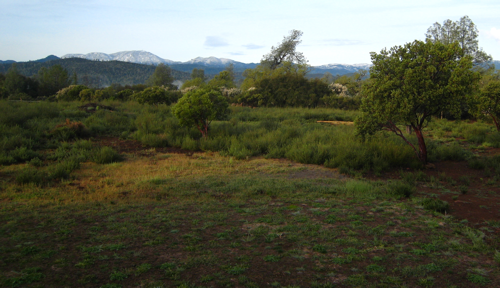 Finally, here’s the big picture showing our recently-built (final) chicken coop on the left (click on the image for larger pic). We’re still adding more plants, sorely needing ornamentals, but we have had to prioritize. Hopefully next year, we’ll have more grapevines, landscaped paths around the fence, more flowers and attractive shrubs. Our veggie garden and coop in the heat of the summer. And here it is the morning of April 1st, just 3 1/2 months ago, with snow-covered Mt. St. Helena in the background. It looks idyllic here (gee why did you ruin your view? ), but the shrubs you see are a fire hazard (chamise or “greasewood”), and the overgrown former lawn was teeming with yellow star thistle! The cause of cabin fever is not clearly defined. 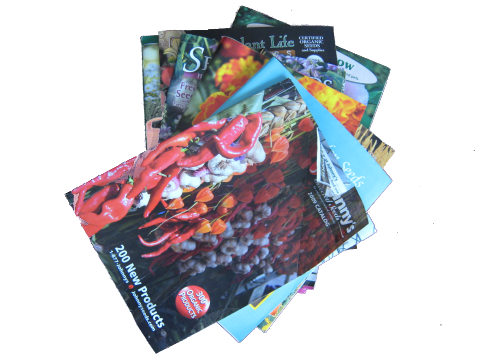 It can be caused by a prolonged cold snap of sub freezing weather, a particularly bad storm, or checking the mail in snow boots and finding several cheerful, brightly-illustrated, encyclopedic seed catalogs waiting for you. The symptoms vary, from homicidal extremes enacted by Jack Nicholson in The Shining, but hopefully for most of us gardeners, it goes something like this: We look at a white blanket of snow and see where the tomatoes will be next year. We try to remember if there was a member of the nightshade family there last year so we can do our crop rotation properly. While a good cure is to start some seedlings, it is a bit too early for that in most parts of the northern hemisphere. So instead, here are a few ideas to help with cabin fever. 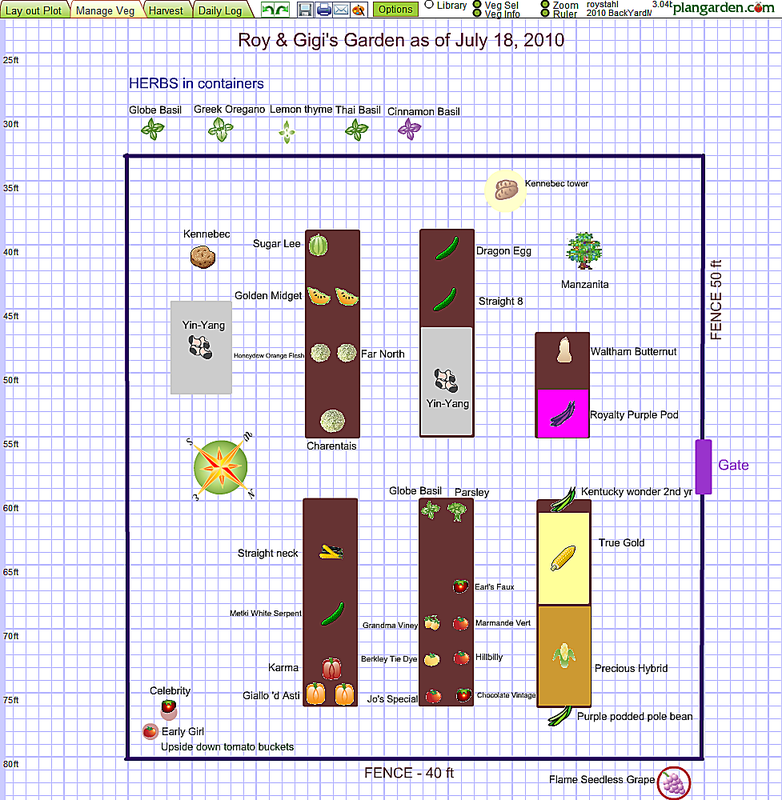 Start planning your garden for next year. You can use Plangarden free for 45 days as an alternative to graph paper and pencils! Look through what you planted lasted year. Make the adjustments, and come up with a plan that will be just right for 2009. Join a social media group and talk about gardening. 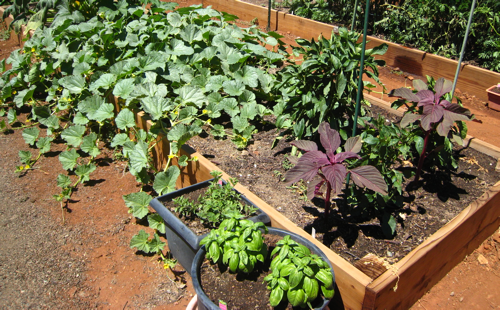 Plangarden, Twitter, The GardenWeb, and Dave’s Garden have forums where people exchange ideas about vegetable gardening. And who knows? 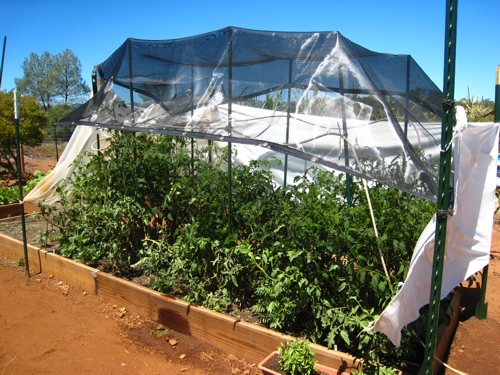 Someone having gardening woes in the southern hemisphere may actually benefit from your wisdom and experience! Start some indoor herbs. When the days get longer, a little success with a culinary herb at a kitchen window can be the right remedy to cabin fever! Last year I looked at the border hedge between my neighbor and me and realized that while the pineapple guava (recommended by Pam Peirce in her book Golden Gate Gardening) were doing ok, they were not the greatest looking plants. The soil was horrible clay and had trees in it before. 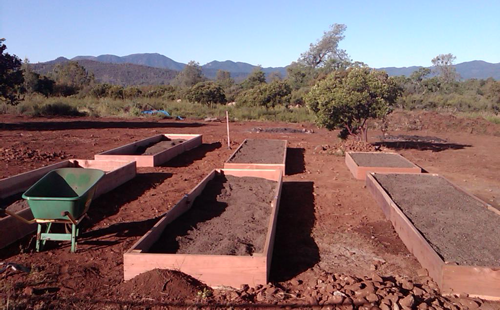 Originally, I dug compost in right before planting the guavas. Not bad, but still not good. So at the end of last year I removed the bushes and started a several-month-effort to get the soil ready. Mind you I don’t have much free time, so it may sound like I did more work than I really did. I first dumped some vermicompost in the are (compost done with red composting worms). I am lazy and don’t do too good of a job separating the compost from the worms, so I know the soil will have lots of worms. Even if the compost worms can’t live there forever, they do great things for the soil and to decompose things. I then threw on half composted materials. 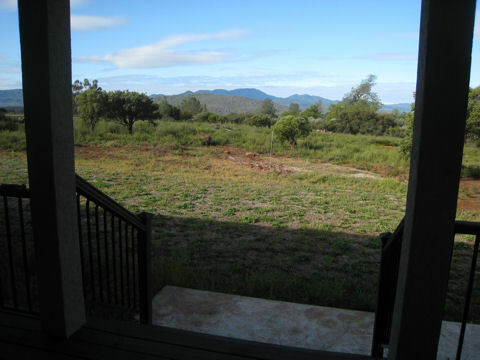 Later I saw weeds coming up so for two weeks I dumped fresh grass on top and let it get hot and kill the weeds. I called my local Half Moon Bay Nursery and confirmed that they would get berries in January. After some initial rain storms I got out and turn the soil around and dug down to get the compost mixed in with the clay. Then I finally planted the berries. That has been a month and a half ago and now they are starting to wake up and the woody stalks are getting green. The olallieberries are going to be the last to burst open, but then I do need to get some time so I can put posts in the ground and rung trellis wires. While I don’t plan on entering too much into Plangarden on these, I will record the harvest so I know how much I get out of them.